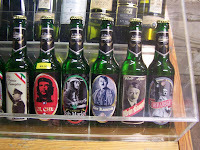 I found this collection of celebrity beer at a shop in Venice, Italy last summer. It was 4 euro, so I passed on sampling it because: A) I'm cheap and B) I hate beer. I'm going to Venice this weekend though, so maybe I'll buy a bottle as a souvenir or something.